First of all thank you everyone for lovely message and sorry for not posting as frequently as before but as you can imagine I am too busy feeding, changing nappies and looking after Chhori that there is no time for anything else. If there is any spare time, I would love to sleep but sleeping for long periods of time seems like a distant dream right now. As you all know there are lots of rituals in Hindu culture when one has a baby. 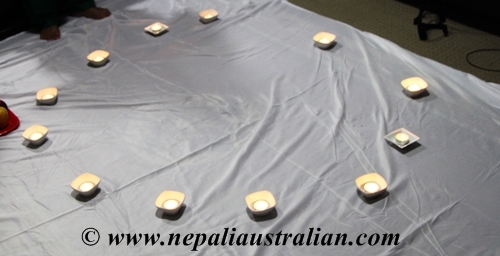 Now with Chhori, we want to follow all the rituals as well even though we are not in Nepal. The first ritual we performed is called Chhaithi. Chhaithi ceremony is performed when the baby is six days old and takes place late in the evening. For Chhaithi, the fufu (baby’s dad’s sister, or the baby’s paternal aunt) will need to bring some koseli (gifts for the baby) which includes fruits and sweet along with a new pair of clothes for the baby. She will also bring a notebook and a pen. In our case, as AS doesn’t have any sister here, the ceremony was performed by my SIL. So to start the Chhaithi, my SIL sat with Chhori surrounded by 12 tea light candles (traditionally we use oil lamps) and one more candle was lighted for god. According to tradition, there is a belief that on the 6th day after the birth of the child, Vidhaata (Goddess of destiny) would quietly enter the house around midnight to pen the destiny of the newborn. Traditionally the mother of the newborn lights a lamp and this lamp along with a pen and paper given by fufu are placed on a wooden plank for Vidhaata to write the future of the newborn. After my SIL finished performing the ritual, everyone else in the family performed the rituals by giving Chhori money and gifts. Then I gave my SIL gifts and she gave the baby back to me. After the ceremony when the Chhori went back to sleep, we placed the notebook and pen next to the bassinet along with one of the candles. I prayed to the Goddess that she be given a bright future with a healthy life. This concludes the first of many rituals my Chhori will have in her life. This entry was posted in Nepali Culture, Newari Culture, Our daughter and tagged Chhaithi, chhori, motherhood, Nwaran, Nwaran and Pasni, Pasni. Bookmark the permalink. That is so beautiful. I love to hear your traditions. May baby Chhori be blessed with great Wealth, Health and Happiness. So lovely – beautiful family! I’ve been absent on my reader for a long time. Congratulations on the sweet little baby!!!!! Aww she is here!! She is beautiful! !Lots of love to your little Princess! !Any names yet? Beautiful. I like how everyone in family has an important role in different aspects of our life.